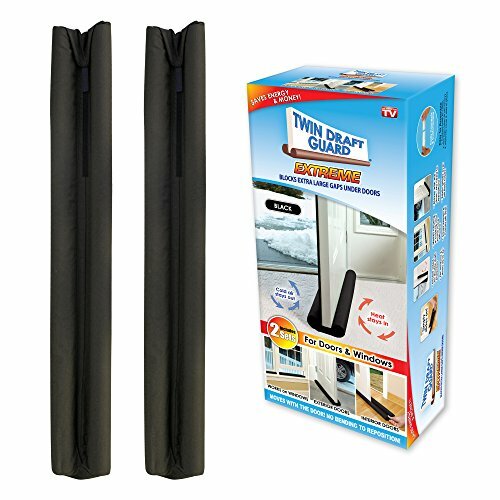 Twin Draft Guard is a double sided insulating device for doors AND windows The fabric draft stopper sleeve holds foam cylinders on opposite sides of a door, creating an airtight, draft-proof seal. Door Draft Guard works on any floor, even carpets, to insulate living areas, garages and basements. The insulating device for doors with extra large gaps Cold air stays out, Heat stays in. Includes 2 Twin Draft Guard - Extreme door draft stopper in Brown color. Fits doors up to 36. Save energy and money Door draft snake makes heating and cooling your home more efficient. Patented hook and loop adjustable closure for a secure custom fit. An original product from Hampton Direct, Inc., the official maker of Twin Draft Guard. If you have any questions about this product by Twin Draft Guard, contact us by completing and submitting the form below. If you are looking for a specif part number, please include it with your message.